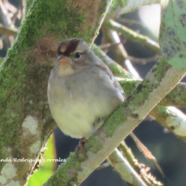 This juvenile White-crowned Sparrow (Zonotrichia leucophrys) showed up mid November in the town of Rancho Quemado on the north end of the Osa Peninsula. It was first observed by Yolanda Rodriguez Corrales who is a member of the Biological Monitoring group of the community. This is the first time this species has come this far south in its winter range to our knowledge, and believe me, it is a topic of conversation and new visitors to the area. While morphological differences are very slight between the male and the female, this first year male is already practicing his song. He is currently in a garden habitat feeding on spilled ground corn and other seeds, as well as bananas from the bird feeder with other Neotropical migratory birds such as the Summer Tanager and Baltimore Oriole and a large handful of resident birds. He has on occasion also been seen eating insects. He spends most daylight hours foraging on the ground or perching in orange and mammon chino trees. The breeding range for this species is generally Canada, Alaska and some parts of the northern United States. The winter range is widespread across the United States and down into central Mexico. This is the only individual reported for Costa Rica so far but I can tell you he is being well taken care of! Our question about this new visitor is; why did he go so far south outside of his normal winter range? 2017 brought several large storm systems to include Hurricane Harvey, Irma, Maria and tropical storm Nate which may have pushed this individual into Central America. We also know that pesticides are causing disorientation in migratory songbirds resulting in displaced birds. Whatever the reason, we are happy to have him here and hope that he returns to his natural breeding grounds in North America in the next few months.